This 60+ year old patient presented with rapidly progressive left-sided chemosis and proptosis. No fever. Mildly elevated WBC count. ESR=28. There was mild horizontal diplopia on exam, with mild drop in acuity. No meningeal signs. She did not appear as sick as we had expected. Outside institution CT showed enlarged left superior ophthalmic vein, left orbital proptosis, and congestion of the intraorbital fat. A diagnosis of carotid cavernous fistula was suspected and patient transferred to us for further workup. Left ICA injections beautifully demonstrate congestion / hyperemia of the extra-occular muscles (middle image, brown arrows). 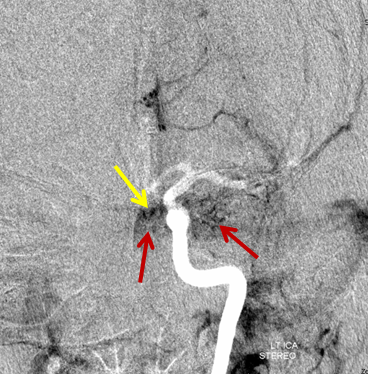 The cavernous sinus (yellow) appears late in venous sequence and does not show any drainage — with contrast persisting in the very late venous phase (rightmost image). The findings imply cavernous sinus thrombosis. 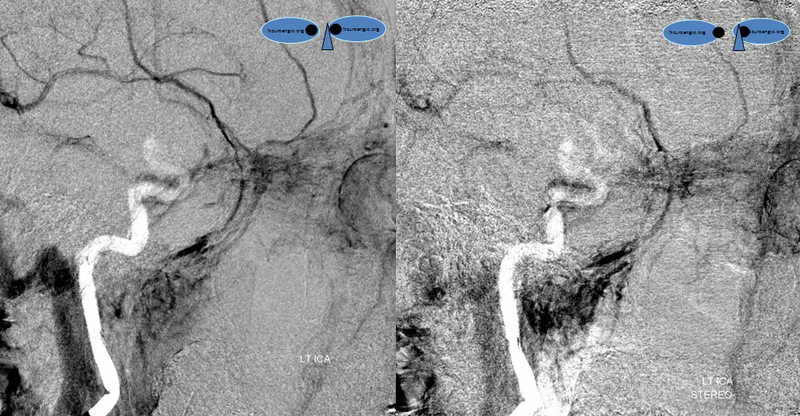 Using arterial phase as a mask in rightmost image allows one to definitively establish the location of the cavernous sinus in relation to the white ICA. AP view of the same injection. 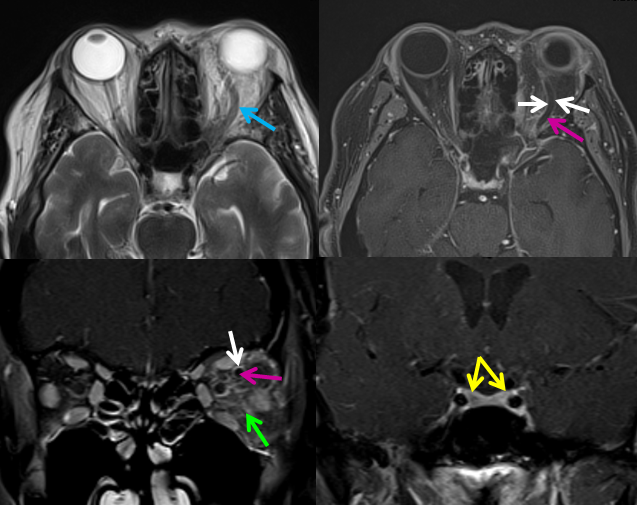 The EOMs and cavernous sinus are superimposed. The patient was started on Vancomycin and Zosyn (Pipercillin/Tazobactam) and full dose unfractionated Heparin, and showed obvious improvement over the next 24 hours.